Tuesday September 21st 1920 I washed some of my things and emptied a sack of sugar I got yesterday. I rested and sewed some in afternoon. Alone in evening. The girls to a picture show. Wednesday September 22nd 1920 I ironed in the AM and sewed what spare time I had. Had letters from Lydia and Grace Taylor. Ott & Fannie spent the evening with us. weather warm. 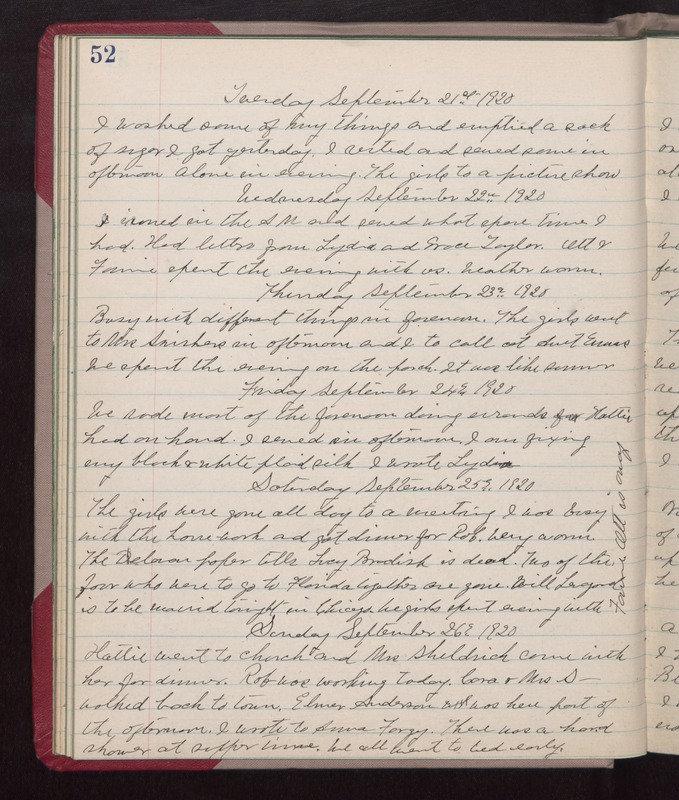 Thursday September 23rd 1920 Busy with different things in forenoon. The girls went to Mrs Swishers in afternoon and I to call at Aunt Emmas. We spent the evening on the porch. It was like summer. Friday September 24th 1920 We rode most of the forenoon doing errands for Hattie had on hand. I sewed in afternoon. I am fixing my black & white plaid silk. I wrote Lydia. Saturday September 25th 1920 The girls were gone all day to a meeting. I was busy with the house-work and got dinner for Rob. Very warm. The Delavan paper tells Lucy Brodish is dead. Two of the four who were to go to Florida together are gone. Will Legard is to ne married tonight in Chicago. We girls spent evening with Fannie. Ott is away. Sunday September 26th 1920 Hattie went to church and Mrs Sheldrick came with her for dinner. Rob was working today. Cora & Mrs S--- walked back to town. Elmer Anderson was here part of the afternoon. I wrote to Anna Forgy. There was a hard shower at supper time. We all went to bed early.